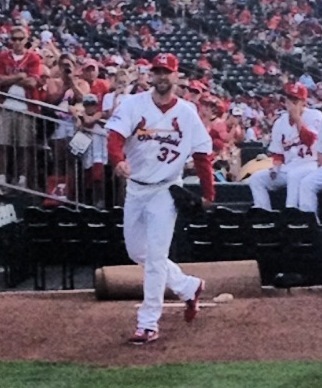 In front of a sold-out crowd of 9,709, Chris Carpenter made his first rehab start of the 2013 season for the Double-A Springfield Cardinals. Prior to the outing, members of the front office said that Carpenter’s pitch count would be limited to 60 pitches. Springfield faced off against Texas League North leaders, the Arkansas Travelers–the Los Angeles Angels’ affiliate. According to an intern for the team, the atmosphere in Springfield resembled a circus with fans crowding the bullpen for his pre-game warm-up and filling the stadium well-above its listed capacity. Given the long layoff from live action, Carpenter looked surprisingly sharp in the first inning. He took care of business against his first live hitter of the season, striking out Randal Grichuk on just three pitches. After allowing a broken bat single to Taylor Lindsey, Carpenter bounced back by mowing down Luis Montanez for his second strikeout of the inning. He got the third out of the inning by inducing a soft ground ball off the bat of Arkansas’ first baseman, CJ Cron. Travelers’ third baseman, Kaleb Cowart, led off the second inning with a laser single up the middle, but Carpenter followed with a strikeout to Travis Witherspoon. Following the strikeout, designated hitter, Ryan Jones, hit a sharp liner to Cardinals’ first baseman, Xavier Scruggs, who was unable to field it–leaving two runners on, one out. Carpenter was able to show off his stuff by unleashing a nasty curve ball to strike out Carlos Ramirez for out number two. To end the inning, Rolando Gomez weakly bounced out to Scruggs at first. Carpenter started off the third by striking out Grichuk for the second time in the game. Lindsay followed with his second hit off of Carpenter–a double over James Ramsey‘s head. Following the double, Jimmy Swift drove Carpenter’s pitch completely out of Hammonds Field for a monster home run–giving the Travelers a 2-0 lead. Cron followed with a pop-out to second base for the second out. After issuing his first walk of the game to Cowart, Witherspoon hit a line-drive single to center field. Following the single, Carpenter’s pace significantly slowed down. He then issued his second walk of the inning to load the bases. Carpenter, who had been averaging in the low 90s all game, was then able to reach an impressive 95 MPH on the radar gun, but after a bobble fielding a grounder by Ruben Gotay at third, the Travelers took a 3-0 lead. After the misplay and near his pitch limit of 60, Carpenter was relieved by Jose Almarante. Despite the rough outing, he left the field to a roaring standing ovation from the Springfield crowd. Thus, Carpenter allowed two earned runs in two and two-thirds innings. His first two innings were very efficient–pitching just 13 pitches each inning. He was able to strike out five batters while walking just two. His curve ball looked sharp, and the speed of his fastball was impressive considering it was just his first rehab start of the season. Statistically, it may not look like a very good start, but it was exactly what the Cardinals wanted from him. One of the biggest factors will be how he feels tomorrow. Let’s hope he feels good enough to continue his road back to the big leagues by making his next scheduled start for Springfield. According to Mike Ceide of WREG TV, Carpenter’s next start will be Saturday night against Oklahoma City. This entry was posted in cardinals and tagged Chris Carpenter, Springfield Cardinals, St. Louis Cardinals by stlcupofjoe. Bookmark the permalink.